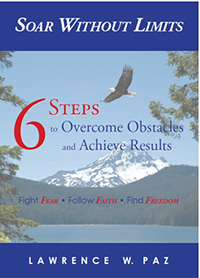 SOAR Without LimitsSOAR Without Limits is a six-step process to overcome obstacles and achieve results. It can apply to a range of life experiences, and it addresses social and psychological factors that promote a fulfilled, healthy, and productive lifestyle. Hairy's Ultimate AdventureHairy's Ultimate Adventure is a heartwarming story that will bring a tear to your eye and a smile to your face, while bringing comfort and hope to all pet lovers who have ever lost a pet. The story helps alleviate your pain of loss and reminds you of the precious memories and pleasures that your own pet brought you. Memior - My Time My LifeWe all have a predefined time to be on this earth. What lies ahead in this vast universe is yet to be determined. This is my story with its good and challenging times. I have tried to focus on the good times. To dwell on the challenging times puts me in an uncomfortable frame of mind. Regrets? I have a few. Baby ShoesWhat began as a worldwide call for authors became a collection of short, gripping stories from every genre you can imagine. Spend a minute each with one hundred minds, with literary slices from noir detective, to holiday heartwarmer to serial killer thrill, flight of fantasy or erotica. 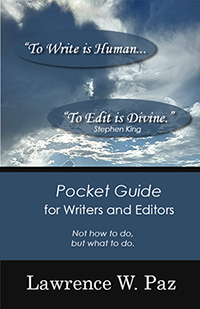 Writer's Pocket GuideThis handy Pocket Guide will help writers and editors create a professional manuscript that achieves the writer's desired outcome. Many times, the difference between acceptance and rejection of a manuscript is how well it is edited. This guide will give the writer and editor a common foundation for communication. Working together they can turn a good manuscript into a great one. An editor can be a writers greatest ally or foe. The right editor can help a writer create a high-quality product. This pocket guide is for fiction and non-fiction writers who want editing and self-publishing services. It is written in simple straight forward language. The different types of editing are explained and a step by step process for writers and editors is presented. This is not a "how to" book on writing or editing. it's a "what to do" book to facilitate the communication between writer and editor. FlashSo many stories....so little time. FLASH! is the second volume in a series of crowdfunded celebrations of short-short fiction. 100 authors. 100 stories. No holds barred. That's the theme, and under it you'll find every kind of flight of imagination you care to explore. From debut authors to seasoned professionals, this book's writers bring you short glimpses into their imaginations. Our comprehensive, exciting processes and guides provide both young and mature individuals with the tools to develop skills that will help them act confidently, successfully, positively, and effectively. They apply to a wide range of life experiences. These processes and guides address social, practical and psychological factors that promote a fulfilled, healthy, and productive lifestyle. SOAR Without Limits is a comprehensive, exciting process that provides both young and mature individuals with the tools to develop skills that will help them act confidently, successfully, positively, and effectively. It can apply to a wide range of life experiences. The process addresses social and psychological factors that promote a fulfilled, healthy, and productive lifestyle. Create healthy alternatives to non-productive behavior. Build essential skills to resist social pressures, take realistic risks, and use a positive approach to achieve your desired outcomes. Develop higher self-esteem and self-assurance to tackle the tasks needed to grow and prosper in a competitive world. Gain the power to effectively convert stress into productive activities. Amplify your knowledge, talents, and skills to improve your lifestyle. Add to your leadership skills with proven, effective, and reliable techniques. Enhance your reasoning and behavioral capability to live a life filled with happiness and achievement. Those who have attended our seminars and workshops over the years validated this process. This is not Theory 101; it’s Practical 402. SWL Media and Learning Center's editing, proofreading, and self-publishing services provide creative development that help our writers make their dreams become a reality. Our writers, editors, designers, and illustrators passionately support writers and editors. Our desired outcome is to help you create and produce a first-rate publication. What will you get for your investment in SWL Media and Learning Center? A final proofread copy ready for publication, if needed. We encourage you to rise above your present level of expertise. Together we can grow our craft to be the finest it can be.